I believe you're right since any public park under control of the Park District is verboten. Unfortunately I agree with your assumption. The entire lake front is a park and therefore is a prohibited place. Pretty ridiculous to me given the number of stories you hear every year regarding people getting attacked along the lake front. Download the Chicago bike map and stay on the lakefront trail. Thanks for the feedback, guys. The rules about carrying on the 'trail' confuse me, but my concern involves hanging out by the water. During the debate, I believe it was stated that it did not include the entire lake front. Can somebody look back through the forum and check that out? What map? I just find a search function. Edited by spec5, 16 April 2014 - 03:26 PM. The only public access to Lake Michigan in the City of Chicago is through property controlled by the Chicago Park District. Even the paved lakefront between North Avenue and Millenium Park is part of the Park District. Navy Pier is controlled by the Metropolitan Pier and Exposition Authority, a municipal corporation, and carry is banned as governmental property and as an amusement park. The Lakefront Bike Trail would seem to be ok as it originates as a continuous designated trail outside the park system on both ends. Stopping to use the restrooms (or dismounting and leaving your bike for any reason) would put you in violation, so leave the park for that purpose. @Spec5, click the link and scroll down a bit. Indigo, to be strictly legal, do you believe that you would have to enter the bike trail from outside Chicago? So, let's take a look at this. Instead of having to remember 23 items, you only have to remember 9. In Texas, it is my understanding that publicly funded places cannot be prohibited for the most part, because they are PUBLIC. I transport in my car M-F during working hours. Any other time I carry unless I know we are going somewhere prohibited. Then it's knife and pepper spray to hold me over. It just blows my mind that many of the prohibited locations in our current carry law are places where one would need to carry most. I guess that's just the anti-side coming through, that their logic is if we prohibit the lawful carriers from being able to properly defend themselves then somehow the criminals will stop committing crimes. Got it. I had to open it to View Full Site then it worked. I believe that's referred to as "magical thinking", or "insanity". Lets talk about Parks in small cities for a moment. Our Chief of Police published a long article in the local paper yesterday. Mostly calm stuff, but at one point he stated that CCW holders would be arrested if they had a firearm in a vehicle in the city park. I thought that we have Safe Haven in our vehicles, such that when we drove into a parking lot of an otherwise prohibited place, that we could secure our pistol and be fine with regard to the law. Am I all wet or did he mis-speak? Your vehicle is a safe haven in EVERY prohibitted area EXCEPT Nuclear facilities and places where firearms are banned per federal law. That is exactly the training that I had. I will approach him and try to determine if he just lost his train of thought or got a mite bewildered for a moment. Maybe he got left out of the training video for the Police, who knows! Anyone know where clear guidance on this prohibition can be found? Thanks. Is there any allowance for entering the grounds and parking lots of the VA Hosp in Danville? Some folks have to travel a long way to get there. You will have to find out from someone if the parking lot is a posted location under title 18. If it is not posted you will be fine in your vehicle. I have no doubt the building will be posted in accordance with title 18. Download the Chicago Bike Map. 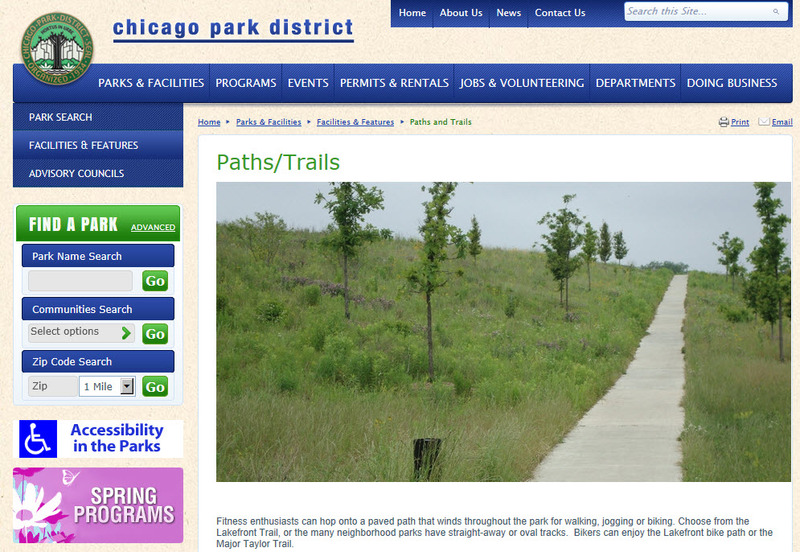 It looks like you can enter the Lakefront trail many ways, from Sheridan Road, Lawrence Ave, Irving Park, Addison, etc. Almost all of the Lakefront Park consists of public right of way. I think that as long as you are walking along, and not entering into a building you are legal. Ooh. Be careful with this: "public right of way" is generally used in reference to roads and highways. Given the typical Chicago politician/police officer/Cook County Sheriff's views on this subject, I would be afraid of becoming a test case. The lakefront park system consists of a series of city parks (one of the 23 categories of prohibited places) that are joined. The beachfront access is part of the parks, as are the pedestrian paths and bikeways. While there are streets that pass through the parks at various points, and there are driveways that lead to and from parking areas, there are no public rights of way IN the parks. As a practical example look at the "Park Closes at..." signs, which indicate that public presence is prohibited between certain hours. Not possible on a public right of way. A lot of the definitions of "public right of way" that I find on the internet include the term "path" and since Section 65 c references "a concealed firearm carried on his or her person" as well as in a vehicle it seems to contemplate walking as well as driving. Most of us don't walk on a road or highway so side walks and paths that cross prohibited areas must be included. "Public right of way" means that portion of the highway or street adjacent to the roadway for accommodating stopped vehicles or for emergency use; or that portion of a street between the curb lines, or the lateral lines of a roadway, and the adjacent property lines. 2) Any building, real property, and parking area under the control of a pre-school or child care facility, including any room or portion of a building under the control of a pre-school or child care facility. Nothing in this paragraph shall prevent the operator of a child care facility in a family home from owning or possessing a firearm in the home or license under this Act, if no child under child care at the home is present in the home or the firearm in the home is stored in a locked container when a child under child care at the home is present in the home. What constitutes a "child care facility"? Someone I know works for an after school program like Sylvan's (no, it is not Sylvan's, but one of its competitors). It is not a child care center per se, but it is a private after school tutoring center. Would she be permitted to carry her firearm there?